An absurd offside decision paved the way for a disastrous home defeat for Livi as Dumbarton came from behind to leave West Lothian with all three points for the fourth time in a row. With the Lions leading 1-0 after Danny Mullen’s fine first-half strike, Myles Hippolyte played Keaghan Jacobs, who was at least two yards onside, clean through and he chipped home a classy finish only to be denied by linesperson Kylie McMullan’s horribly-erroneous flag and Dumbarton took full advantage to stage a dramatic late fightback. The Lions had made a bright start and came close after six minutes when Mullen and Hippolyte combined well before the latter fired in a decent effort which went straight at Sons’ keeper Jamie Ewings. Hippolyte was looking lively and was unfortunate to see the linesman’s flag go up after being played clean through. Mullen tried his luck from distance once again on 21 minutes but could only send his effort high over the bar. The Lions, and Mullen, finally got some reward for their strong start as the deadlock was broken on 27 minutes when Hippolyte found Mullen and, as he did against Queen of the South a few weeks ago, he left the Dumbarton defenders in his wake with a fine jinking run before coolly slotting a shot into the bottom corner for 1-0. Mullen was proving a real nuisance for the visitors and full-back Gary Fleming picked up the game’s first yellow card for a clumsy foul on the livewire Livi frontman. Mark Gilhaney followed soon after for a cynical foul on Shaun Rutherford. Livi missed a golden chance to double their lead on 36 minutes when Hippolyte swung in a cross from the right which found Gary Glen unmarked in the six-yard box and his header bounced down of the crossbar, landing on the line but bouncing agonisingly back out again. It proved the final action of note in the first half as Livi went in at the break with a well-earned 1-0 lead. Livi came out for the second half determined to put the game to bed and would have done so but for the near-side linesperson’s misguided intervention which denied Keaghan what would have been a fine team goal and sent the home bench into a justified rage. The Lions were stung by that disallowed goal and redoubled their efforts to try and kill the game off, Glen setting up Mullen with a fine ball across the box only for the youngster to shoot just wide. As has become alarmingly frequent in recent weeks, Livi’s nerves steadily grew the longer it remained 1-0 and eventually they were punished for their profligacy as Dumbarton drew level. A corner from the right wasn’t dealt with and the ball fell to Fleming inside the six-yard box and he fired a shot high into the net through a crowd of players to square the game. Livi’s confidence was shot after the loss of the goal and within ten minutes they found themselves behind as the visitors counter-attack was rounded off by a low finish into the corner by Mitch Megginson. 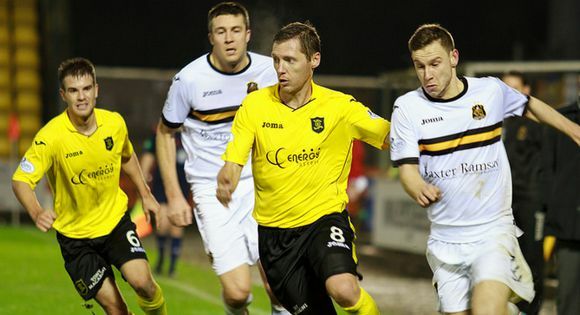 Livi’s attacks became increasingly desperate, but worryingly infrequent, as they battled to get back into the match and, despite throwing caution to the wind and throwing on both Jordan White and Rob Ogleby, they failed to muster any kind of threat as Dumbarton saw out the match with a concerning degree of comfort. An eleventh game without a win leaves Livi second-bottom of the Championship as they head to Cowdenbeath, the only side below them, for a match which takes on a whole-new level of significance as Livi slide deeper and deeper into a relegation dogfight they had started the season with no intention of being involved in.